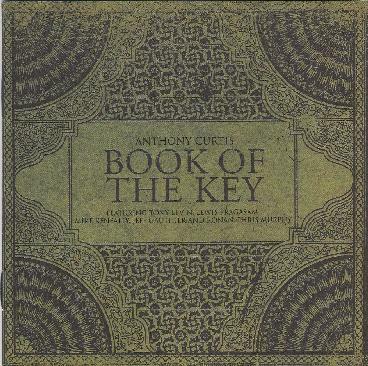 Anthony Curtis - "Book of the Key"
This is a totally amazing CD. The jams-improvisations that make up the tracks on this CD take you on some serious adventures. Curtis is backed up with a totally killer band including Tony Levin on Chapman Stick, Lewis Pragasam on drums, Jeff Gauthier on violin, Mike Kenneally on Fender Rhoads and Ronan Chris Murphy on Harmonium. Oh yeah.. Anthony is a very cool innovative guitar player. The opening track, "Ruins" is 16 minutes and very cool and quite psychedelic at times. "Gallabalba" is like a power workout for two minutes with intense stick and guitar playing. "Inland Sea" is a 3 minute eastern journey which leads into the 23 minute title track. I love the eastern influence in the music. Now we are treated to a series of short and very interesting tracks before the next epic, "Hikmat Al-Israq". The CD ends with "The Oracle". There is so much feeling in the playing while maintaining a cool unpredictable vibe in the music that carries you away. It would be great if more people made music like this. Amazing stuff. For more information you can visit the Anthony Curtis web site at: http://www.anthonycurtis.net.